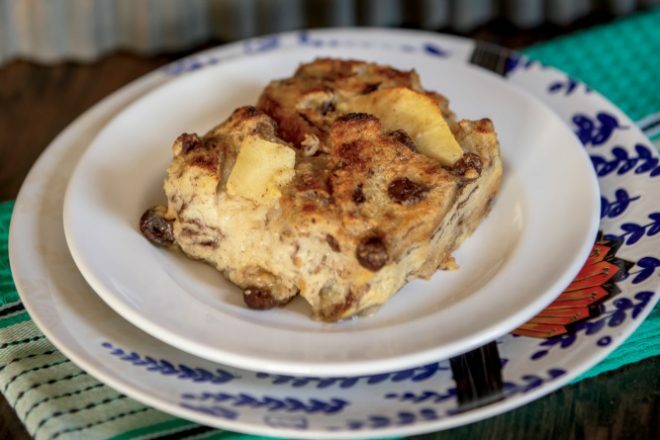 People with a sweet tooth will find it hard to resist my Cinnamon Apple-Raisin Bread Pudding. This wholesome dessert is easy enough to make during the week for your family, yet elegant enough to serve guests. The apple cider and dried, sliced apple rings contribute a farm-fresh flavor. Another trick: Day-old, whole-grain cinnamon-raisin bread helps soak up the pudding mixture. Serve this satisfying dessert warm with a small scoop of vanilla ice cream, gelato or frozen yogurt. And if you must, drizzle on some dark chocolate sauce.